Figure A. RPE conjugated Mouse anti Bovine CD8b (MCA1654PE) and FITC conjugated Mouse IgG1 isotype control (MCA928F). Figure B. RPE conjugated Mouse anti Bovine CD8b (MCA1654PE) and FITC conjugated Mouse anti Bovine CD21 (MCA1424F). All experiments performed on red cell lysed bovine blood gated on lymphocytes in the presence of 10% bovine serum. Data acquired on the ZE5™ Cell Analyzer. 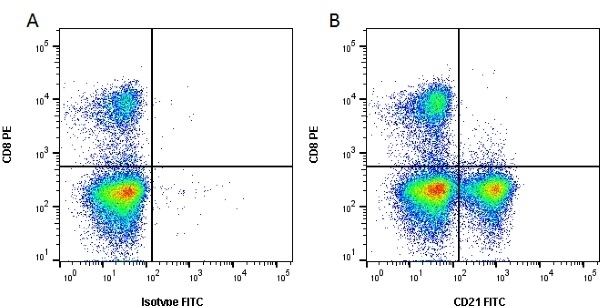 Figure A. RPE conjugated Mouse anti Bovine CD8 (MCA837PE) and FITC conjugated Mouse IgG1 isotype control (MCA928F). Figure B. RPE conjugated Mouse anti Bovine CD8 (MCA837PE) and FITC conjugated Mouse anti Bovine CD21 (MCA1424F). All experiments performed on red cell lysed bovine blood gated on lymphocytes in the presence of 10% bovine serum. Data acquired on the ZE5™ Cell Analyzer. Mouse anti bovine CD21, clone CC21 has been used to demonstrate the co-expression of CD21 with PrPc on B cells of scrapie infected sheep (Halliday et al. 2005). Spleen cells from immunised BALB/c mice were fused with cells of the mouse NSI myeloma cell line. Howard, C.J. et al. (1991) Summary of workshop findings for leukocyte antigens of cattle. Naessens, J. et al. (1990) Characterization of a bovine leucocyte differentiation antigen of 145,000 Mw restricted to B lymphocytes. Lwin, S. et al. (2009) Immune cell types involved in early uptake and transport of recombinant mouse prion protein in Peyer's patches of calves. Cell Tissue Res. 338: 343-54. Breugelmans, S. et al. (2011) Immunoassay of lymphocyte subsets in ovine palatine tonsils. Halliday, S. et al. (2005) Expression of PrPC on cellular components of sheep blood. J Gen Virol. 86 (Pt 5): 1571-9. Breugelmans, S. et al. (2011) Differences between the ovine tonsils based on an immunohistochemical quantification of the lymphocyte subpopulations. Comp Immunol Microbiol Infect Dis. 34: 217-25. Richt, J.A. et al. (2007) Production of cattle lacking prion protein. Brujeni, G.N. et al. (2010) Bovine immunodeficiency virus and bovine leukemia virus and their mixed infection in Iranian Holstein cattle. J Infect Dev Ctries. 4 (9): 576-9. Kiku, Y. et al. (2010) Decrease in bovine CD14 positive cells in colostrum is associated with the incidence of mastitis after calving. Vet Res Commun. 34: 197-203. Pilla, R. et al. (2012) Long-term study of MRSA ST1, t127 mastitis in a dairy cow. Chattha, K.S. et al. (2010) Immunohistochemical investigation of cells expressing CD21, membrane IgM, CD32 and a follicular dendritic cell marker in the lymphoid tissues of neonatal calves. Vet Immunol Immunopathol. 137: 284-90. Sigurdson, C.J. et al. (2002) PrP(CWD) lymphoid cell targets in early and advanced chronic wasting disease of mule deer. J Gen Virol. 83: 2617-28. Dagleish, M.P.et al. (2012) Immunophenotype of cells within cervine rectoanal mucosa-associated lymphoid tissue and mesenteric lymph nodes. J Comp Pathol. 146: 365-71. Edwards, J.C. et al. 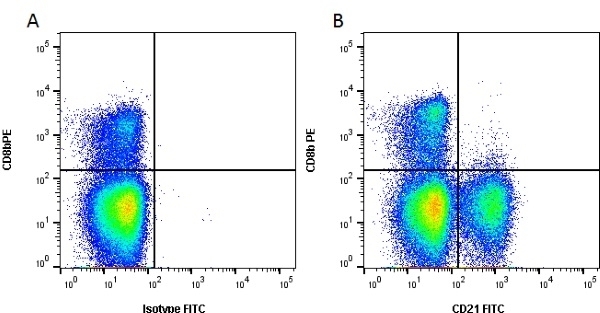 (2010) PrP(Sc) is associated with B cells in the blood of scrapie-infected sheep. Meganck, V. et al. (2014) Development of a method for isolating bovine colostrum mononuclear leukocytes for phenotyping and functional studies. Booth, J.S. et al. (2010) Co-stimulation with TLR7/8 and TLR9 agonists induce down-regulation of innate immune responses in sheep blood mononuclear and B cells. Dev Comp Immunol. 34 (5): 572-8. Nikbakht Brujeni, G. et al. (2016) Association of BoLA-DRB3.2 Alleles with BLV Infection Profiles (Persistent Lymphocytosis/Lymphosarcoma) and Lymphocyte Subsets in Iranian Holstein Cattle. Biochem Genet. 54 (2): 194-207. Kruger, E.F. et al. (2003) Bovine monocytes induce immunoglobulin production in peripheral blood B lymphocytes. Dev Comp Immunol. 27 (10): 889-97. De Matteis G et al. (2016) Evaluation of leptin receptor expression on buffalo leukocytes. Vet Immunol Immunopathol. 177: 16-23. Ekman, A. et al. (2010) B-cell development in bovine fetuses proceeds via a pre-B like cell in bone marrow and lymph nodes. Dev Comp Immunol. 34 (8): 896-903. Silva, A.P. et al. (2015) Encapsulated Brucella ovis Lacking a Putative ATP-Binding Cassette Transporter (ΔabcBA) Protects against Wild Type Brucella ovis in Rams.